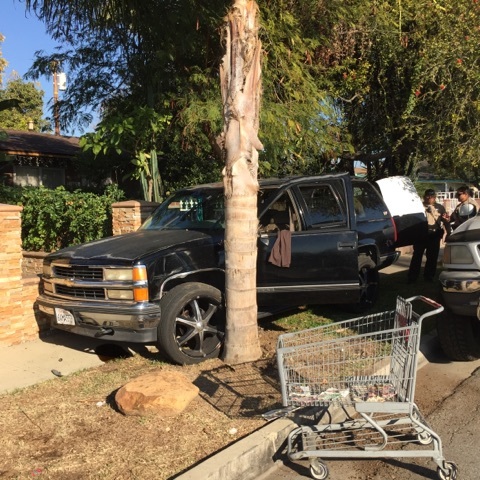 EAST VALINDA >> Deputies arrested a carjacking suspect after he led them on a chase, which ended in a crash in East Valinda Wednesday, authorities said. The incident began shortly before 2 p.m. when deputies spotted a suspect wanted in connection with a carjacking driving in the unincorporated county area of East Valinda, according to Los Angeles County Sheriff’s officials. The SUV has been reported carjacked in Hawthorne, Lt. David Infante said. “The suspect was considered armed and dangerous,” the lieutenant said. Aided by a helicopter, deputies chased the SUV along surface streets for about 15 minutes before the driver crashed into a tree along McLaren Street, between Jellick Avenue and Trafalgate Avenue in East Valinda, and continued to flee on foot, officials said. 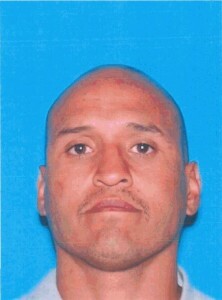 Deputies captured the suspect as he was pounding on or trying to kick in the door of a nearby home, Infante said. The home may have been that of a relative of the suspect. The name of the suspect was not available Wednesday afternoon pending booking. 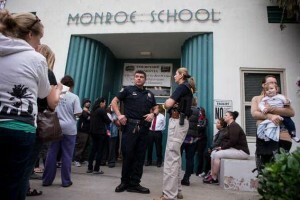 MONROVIA >> Police arrested four suspects who led Monrovia police on a short chase in a carjacked minivan before continuing to flee on foot, prompting a lockdown at an elementary school where one of the suspects was ultimately arrested, authorities said. A police automated license plate reader spotted a stolen 2006 Ford Freestar about 11:30 a.m. at Mayflower Avenue and Colorado Boulevard, police officials said. The van had been carjacked Saturday from a senior citizen outside Santa Anita Park in Arcadia. 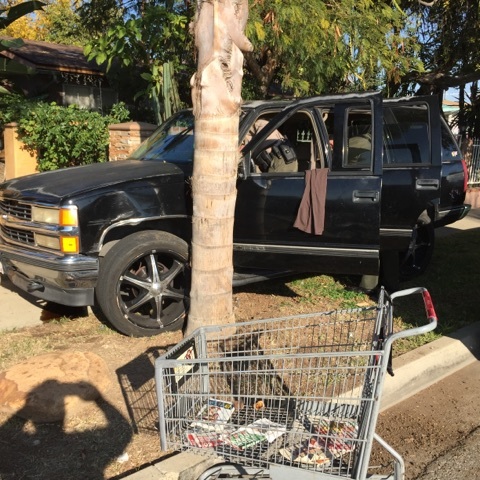 The driver of the minivan led officers on a short chase, which circled the neighborhood and came to and end when the minivan stopped abruptly at Lemon and Mayflower avenues, Monrovia police Lt. Heath Harvey said. Three teens and one young adult — two male and two female — fled from the car and run in four different directions, Harvey said. Two were quickly apprehended, and a third was apprehended with help from Arcadia and Pasadena police during a search of nearby yards. As the search for the fourth suspect continued, officials at nearby Monroe Elementary School, 402 W. Colorado Blvd. called police to report a young woman had arrived at the campus and walked into the cafeteria, Harvey said. The school was placed on lockdown, and officers rushed to the campus where they took the female suspect into custody without a struggle, he said. 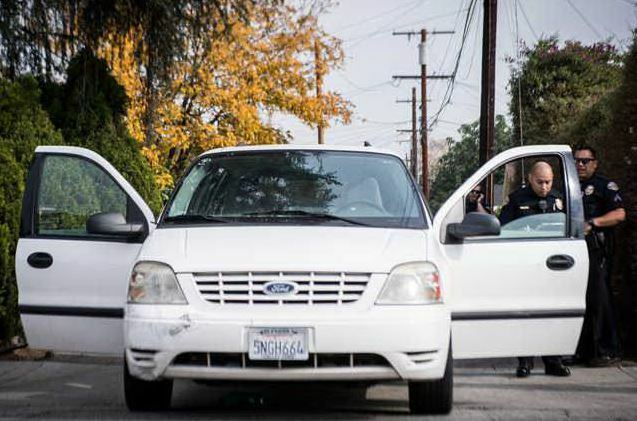 Investigators were still looking into whether the four suspects arrested after fleeing from the stolen minivan were involved in the original carjacking five days earlier in Arcadia. A 68-year-old man was getting out of his car when two teenagers approached him and demanded his car keys, Arcadia police Lt. Mike Castro said. The young men approached the victim and demanded his keys, and he turned them over out of fear. The carjackers fled in the minivan. No weapon was seen. The identity of the adult suspect was not available pending the booking process, officials said. PASADENA >> A man carjacked a driver at gunpoint in a residential neighborhood in Pasadena late Tuesday, police said. A 30-year-old Pasadena man was sitting in his 2006 Toyota Camry about 7:40 p.m. as the car was parked in the 1800 block of El Sereno Avenue, Pasadena police Lt. John Luna said. “The suspect approached on foot, pointed a handgun at the victim and demanded the vehicle,” Luna said. The carjacker was last seen driving east on Tremont Street in the stolen car. COVINA >> A man who reported being carjacked at gunpoint in Covina early Sunday ended up behind bars himself after police determined he made up the story, officials said. Edward Romero, 30, of Azusa called police about 1:40 a.m. and reported he had been carjacked a little over an hour earlier while stopped at a red light at Azusa Avenue and Grondahl Street, Covina police Sgt. Tony Zavala said. Romero told investigators two men were crossing the street and asked him for directions before pulling a gun and demanding his 1998 Honda Civic, Zavala said. But as the investigation continued, the story fell apart, he said. Romero ultimately admitted that he had lent his car to a friend, who had failed to return it, Zavala said. Police arrested Romero on suspicion of filing a false police report, a misdemeanor. He was released with a citation, booking records show. The car remained missing Sunday afternoon and was being treated as a stolen vehicle, he said. A man fatally shot by deputies after carjacking a woman in West Whittier, firing shots and taking hostages inside a Downey barbecue restaurant last week was being sought for questioning in connection with the slaying of a woman found dead inside her burning East Los Angeles home in August, authorities said. 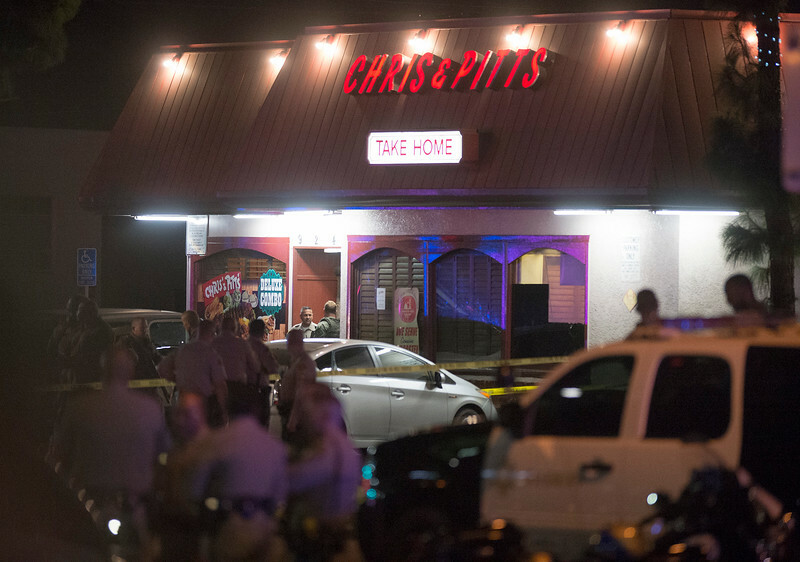 Eddie Tapia, 41, died shortly before 9 p.m. Sept. 10, when Los Angeles County Sheriff’s Special Enforcement Bureau deputies stormed the Chris’ & Pitt’s restaurant on Lakewood Boulevard in Downey where he had held four people hostage for more than an hour and shot him, according to county sheriff’s and coroner officials. The hostages were freed unharmed. The standoff began after Tapia was spotted driving in a stolen car in the Pico Rivera area, then carjacked a woman in West Whittier before firing shots from a handgun as he fled into the crowded Downey restaurant, officials said. As the investigation continued into Tapia, an ex-convict released from jail four months prior to the deputy-involved shooting, detectives revealed he had ties to 46-year-old Rocio Vasquez, who was found dead inside her home in the 700 block of Brady Avenue in East Los Angeles home early Aug. 8, Lt. John Corina of the Sheriff’s Homicide Bureau said. “Initially, the preliminary consensus was that the fire may have been accidental, but additional investigation, as well as an autopsy, would be necessary to confirm how the victim died,” sheriff’s officials said in a written statement. “It was determined during the autopsy that Victim Vasquez had not died as a result of the fire, but she had been shot and killed prior to the fire being set,” according to the statement. Though not named a suspect in the slaying, Tapia was one of several persons of interest detectives have been seeking in connection to their investigation into Vasquez’s slaying. “He was a person we wanted to talk to,” Corina said. “He was her friend,” the lieutenant said, adding that Tapia was known to frequent the victim’s home. Tapia’s city of residence was unclear. No arrests in have been made in Vasquez’s slaying. PHOTO [ABOVE] by Keith Durflinger [BELOW] photo of Eddie Tapia courtesy of the California DMV. SAN DIMAS >> A man violently carjacked an elderly man outside a San Dimas restaurant Saturday before deputies, aided by the truck’s OnStar system, tracked down the vehicle, disabled it remotely and took the suspect into custody, authorities said. The carjacking took place at 7:22 p.m outside a Red Robin restaurant, 565 W. Arrow Highway, Lt. Tonya Edwards of the sheriff’s San Dimas Station said. The suspect, a man in his 20s, attacked a 74-year-old man and yanked him from his 2015 Chevy Silverado, Lt. Elisabeth Sachs said. Authorities were notified of the carjacking minutes later through OnStar, according to Lt. David Buckner, watch commander of the Los Angeles County Sheriff’s Walnut Station, whose deputies assisted in taking the suspect into custody. An OnStar operator provided the sheriff’s department with “up-to-the- moment locations” of the white pickup truck, then remotely slowed it to about 5 mph after deputies spotted it heading south on the 57 Freeway. The driver got out of the car and surrendered near the 91 Freeway about 8 p.m., Buckner said. “He stole the wrong vehicle,” Buckner said. Joshua Frontino-Deaton, 26, was booked on suspicion of carjacking, Sachs said. His city of residence was not available Sunday afternoon. The carjacking victim was treated at a hospital for injuries and released later in the day, Sgt. Joe Bolanos said. According to county booking records, he was being held in lieu of $100,000 bail pending his initial court appearance, scheduled Tuesday in Pomona Superior Court. PASADENA >> Police are seeking a man who used a ruse to carjack an 84-year-old Pasadena woman of her Lexus Friday, officials said. The crime took place about 11:45 a.m. in the 100 block of West California Boulevard, Pasadena police Lt. John Mercado said. The victim had just gotten into her car and turned on the engine when a man approached her at her still-open driver-side door, he said. Mercado said the man told the elderly woman that her car was sparking from beneath and directed her out of the vehicle. “When she exited her car, he got in and drove away, west on California,” the lieutenant said. The woman suffered no injuries. Stolen was the woman’s silver, 2004 Lexus 330 with a California license plate of 5FAB540, he said. The carjacker was described as a white man in his 50s, about 5 feet 7 inches tall, of medium build, with short brown hair. He wore a khaki-colored jacket. COVINA >> A gunman carjacked a man in Covina, ordered the victim to drive him a short distance, then fled with the victim’s car early Friday, police said. The crime took place about 12:15 a.m. after a South Bay man in his mid-30s had just dropped off a friend in the 1100 block of North Sunflower Avenue, Covina police Sgt. Rob Bobkiewicz said. The victim was returning to his vehicle, a white, 2012 Kia Sportage SUV, when the carjacker approached and asked for a ride. When the victim refused, the carjacker pulled a handgun and got into the SUV’s passenger seat, the sergeant said. When the SUV reached the area of Citrus Avenue and Covina Boulevard about two miles to the west, the gunman ordered the driver out of his SUV. The victim’s wallet and cell phone were also stolen. The carjacker fled in the vehicle as the victim walked to a nearby business to call for help. PASADENA >> A carjacker pulled a man from his BMW before driving off in it late Saturday, police said. The crime occurred about 8:30 p.m. as the victim was heading east on Del Mar Boulevard and stopped at a red light at Raymond Avenue, Pasadena police Lt. John Mercado said. The robber ran from a street corner up to the victim’s black, two-door, 2007 BMW 328i, Mercado said. “(The carjacker) opened the driver-side door and ordered the victim to get out,” Mercado said. The victim, a Pasadena man in his 50s, fumbled with his seat belt as he tried to exit the car, he said. The carjacker ultimately pulled him out of the car and threw him to the ground. Police said the carjacker was last seen heading south on Raymond Avenue in the stolen BMW, which has a California disabled person’s license plate number of 370CN. Mercado described the carjacker as a black man between 20 and 30, 5 feet 6 inches to 6 feet tall, 190 to 210 pounds, of muscular build. He was either balding or had very short hair, and he wore a black hooded jacket and blue jeans. Anyone who sees the vehicle is urged not to approach it, but to call 9-1-1 immediately, Mercado said. ALHAMBRA >> Police are seeking a man armed with either a rifle or shotgun who carjacked a man in a residential Alhambra neighborhood earlier this week. The victim arrived home in the 1800 block of South Stoneman Avenue about 11:30 p.m. Tuesday, according to Alhambra police Sgt. Jerry Johnson. He parked along the street and began removing items from the passenger side of the 2013 Nissan Altima when the carjacker approached on foot, brandishing a rifle or a shotgun. After making a statement the victim didn’t understand, “The suspect entered the the car and started it using the ‘push to start’ button,” Johnson said. The victim still had the car keys, so the car was only capable of driving for a short time before shutting off automatically, Johnson said. The car was found abandoned several hours later in East Los Angeles. Police said the victim was not hurt. A detailed suspect description was not available.